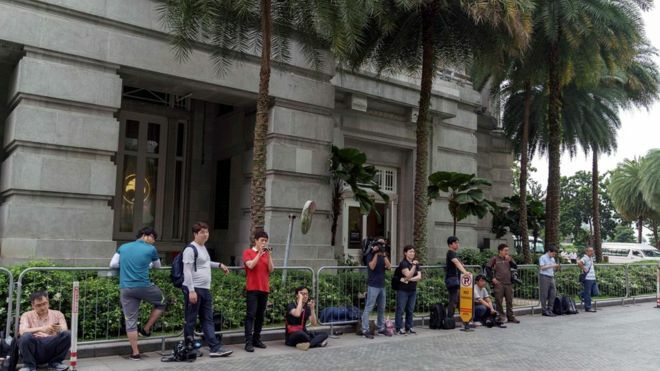 Singapore police have arrested two South Korean journalists who are accused of trespassing in the home of the North Korean ambassador ahead of next week's Trump-Kim summit. Police said they were called to the residence on Thursday afternoon. North Korean leader Kim Jong-un will land in Singapore on Sunday, Reuters quoted a source as saying. Mr Trump has said he will consider inviting Mr Kim to the White House if the Singapore meeting goes well. The US president is also due to arrive in Singapore on Sunday. The US and its regional allies want to see North Korea give up its nuclear weapons but Mr Trump has acknowledged that it "will take longer" than one meeting to realise that goal.